Strikes began when 72,000 Ford workers "downed tools" and walked off the job, leaving 23 Ford factories across the country empty. The phrase Winter of Discontent refers to the British winter of 1978-1979, when widespread strikes marked the largest stoppage of labour since the 1926 General Strike as the working classes and the Trade Unions rebelled against the Labour Party government of James Callaghan, the Prime Minister 1976-79. The period was marked by food shortages, power cuts, household refuse uncollected, and even the dead were left unburied. Twenty-nine million working days were lost to industrial action involving 4.6 million workers. Thirty years later, the memory of snow-bound Britain in the midst of industrial chaos remains deeply etched in the national psyche. It was the key factor in Labour's defeat in the general election of 1979 and continued to resonate in British politics for many years after. "Now is the winter of our discontent made glorious summer by this sun of York" was written by Shakespeare in his play Richard III (1594). It actually means that the period of discontent or unhappiness is ending, winter marking the end of a cycle. The phrase was used to describe the social and industrial unrest of the 1978-79 winter by the political editor of the British national newspaper The Sun. Housing - By 1978 fewer council houses were being built than in any year since the Second World War. Health - 25,000 hospital bed places were removed in the first two years of the Labour government. Education - teachers suffered large scale redundancies for the first time in living memory. Prices - doubled between February 1974 and December 1978. Jobs - an average of 1,000 a day went in Labour's first three years. Unemployment was 500,000 in 1974. It reached 1.6 million in 1976. Wages - a family of four on average earnings was worse off in 1979 than in 1974. The Trade Unions Congress (TUC), an umbrella organisation of Britain's trade unions, had become "tied" to the government following the adoption of the Social Contract, a bipartite arrangement between the government and the trade union movement. "The package was an attempt to control inflation through regulation of prices, provide growth of employment through industrial strategy and improve the social wage by redistributive fiscal policies and changes in patterns of public expenditure, and was to include a programme of employment law involving the repeal of the Industrial Relations Act 1971 , introduction of new statutory protections for employees and rights for trade unions and legislation on industrial democracy . The unions in return were to co-operate in restraining wages." Although the government failed to deliver its side of the bargain, the TUC insisted on upholding theirs, even to the detriment of its member unions: in 1976 the Seamen's Union proposed strike action over a delayed pay award. The general secretary of the TUC, Len Murray, told them, "By god, we'll make sure no union supports you. We'll cripple you." A further three major strikes by groups of skilled workers in 1977 collapsed after the TUC instructed other workers to cross the picket lines. 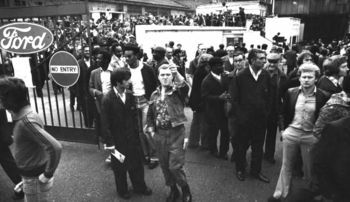 The "discontent" of British workers continued to build for several years; inflation had reached 26.9% in August 1975, and the incumbent Labour government under Prime Minister Harold Wilson introduced a "cap" on pay increases for workers at limits set by the government, and far below the rate of inflation. For workers earning under £8,500 ($17,000) a year the maximum pay increase could not exceed £6 ($12) per week. By 1978, inflation had almost halved, but the government refused to remove the caps, fixing the maximum pay increase at 5%. However, at the end of 1977, firefighters had gone on strike and, despite being forced back to work (the strike had ended violently, with the firefighters even attacking their own Union officials whom they felt had betrayed them), achieved a 10% increase, followed in early 1978 by further concessions from the government, giving them an increase in real terms of 20%. Furthermore, their salaries became index linked against inflation, a privilege which had previously only been accorded to the Army Chiefs, police and judges, as a compensation for not being allowed to strike. The firefighters had however still retained the right to strike. Told that their rises would still be capped at 5% the remainder of the already disgruntled workforce took notice of how the firefighters had been successful in "defeat" and began to see how weak the government had become when challenged by direct action. In April 1976, Wilson had been replaced as Prime Minister by Labour's James Callaghan, and it was widely expected that he would call for a general election and the removal of the wage caps in September 1978 following the TUC conference. Instead, he announced that there would be no general election and that the cap would remain for at least another year to allow the economy to stabilise. The same month, a pay increase for workers at Ford Motor Company was set by the company within the allotted 5% designated by the government but was rejected by the workers. A strike began when 15,000 Ford workers walked off the job on September 22 and by September 26 had been joined by 57,000 others, leaving 23 Ford factories unmanned. The strike by the Ford workers was unofficial, and had not been formally sanctioned by the workers' union, the Transport and General Workers Union (TGWU), however, given the determination of their members not to return to work, and the violence that had marked the previous year's firefighter's strike, the TGWU officially gave its support on 5 October. They demanded a 25% pay increase and a reduction to a 35-hour working week, and negotiations began with the management of Ford. On 22 November they accepted a 17% pay increase, with no reduction in working hours, and returned to work. The government were furious that Ford had breached the pay policy and attempted to impose sanctions on the company, but this was defeated in Parliament, with Callaghan only narrowly surviving a motion of confidence. Humiliated and further weakened, the government was now powerless to enforce the 5% cap, which would now be challenged by strikes in both the public and private sectors. Unlike the strikes which were to follow, the Ford strike was unique in that the entire workforce withdrew their labour - no picket lines were required. English workers in ancillary industries assisted the strike by preventing the movement of components both on the motorways and in the docks, and this also enabled the workers to turn the division of labour between European states against Ford as the majority of European factories were prevented from operating because of the lack of components or because components destined for English factories were held up. Henry Ford said, "It was the worst strike I have ever seen". Analysts have concluded that it was this single strike which caused the Labour Government to fall. In an attempt to win a 40% pay increase, fuel tanker drivers employed by British Petroleum and Esso had begun "working to rule" and refusing to work overtime. They received such small allowances for overnight stops that they were forced to sleep three to a room in dirty hostels. On 9 January 1979, all truck drivers of the TGWU went out on strike for more pay. This crippled the national distribution system, causing food shortages as well as halting the transport of materials required by industry. Fuel stations were closed due to no deliveries to fill their storage tanks, and oil refineries were blockaded by flying pickets. In less than a month, with road distribution at a standstill, the drivers achieved a pay deal just £1 ($2) less per week than they had asked for. While the transport strike was still in force, many public sector workers launched strikes of their own. The railwaymens' unions, the National Union of Railwaymen (NUR) and the Associated Society of Locomotive Engineers and Firemen (ASLEF) had begun to close down the public transport network, and on 22 January the public sector unions called a "Day of Action" which saw 1.5 million workers refusing to work, the largest general stoppage of work in the UK since the General Strike of 1926. Schools and airports were forced to close and ambulance drivers and nurses working for the National Health Service began refusing to treat patients except for life-threatening emergencies. Many workers who struck on the Day of Action simply did not return to work afterwards, staying out on strike until February. In late January, gravediggers went out on strike, and health officials began contingency planing for burials at sea. However, after two weeks of strike action, the gravediggers achieved a 14% pay increase and returned to work. Waste collection workers were also on strike, and refuse began to pile high in the streets. They remained on strike until 21 February, achieving an 11% increase. It is generally held that these three words sealed the fate of the government, even though the person to whom they were attrributed never actually said them. At the height of the strikes, Callaghan flew to Guadeloupe, in the Caribbean, to attend a summit. On his return to Heathrow, he was asked what he made of the mounting chaos. He gave a typically complacent, convoluted answer, "I don't think other people in the world would share the view [that] there is mounting chaos". A journalist for The Sun translated that as "Crisis? What Crisis?" and this was the newspaper's headline on 11 January 1979. Callaghan's standing in the polls went from a five-point lead over the Conservatives in November 1978 to a 20-point deficit in February 1979. After losing a confidence motion, he was forced to call a general election and the Conservative party under Margaret Thatcher won by a landslide. Labour received its lowest share of the vote since the war, while the Liberals and the Scottish and Welsh nationalists saw their support slump from previous highs enjoyed in 1974.
victory for the Conservatives, making Margaret Thatcher Britain's first ever woman prime minister. Winter of Discontent: 30 years on - Slideshow including BBC archive material, and interviews with politicians, union leaders and commentators Denis Healey, Rodney Bickerstaffe, Brendan Barber, Geoffrey Goodman, and Lord Bernard Donoghue. Morgan, Kenneth O. Callaghan: A Life (1997). ↑ The agreement was known colloquially among rank and file union members however as the "Social Con Trick". ↑ Social Contract (2007) European Foundation for the Improvement of Living and Working Conditions. Retrieved 20 November 2008. ↑ A popular joke among workers at the time was that "ASLEF" stood for "As'lef'ma'train in the depot"